I am highly delighted to welcome you to the Arts and Crafts Village, the symbolic headquarters of Culture in the Federal Republic of Nigeria. 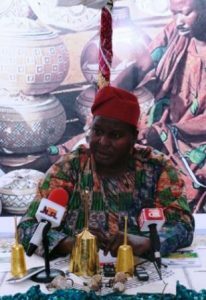 The purpose of this briefing is to update the press, and indeed, all Nigerians on the activities of the National Council for Arts and Culture (NCAC) particularly the forth-coming African Arts and Crafts Expo, AFAC 2017, the largest of its kind in Africa. On my assumption of office about three months ago, I made a firm commitment to all Nigerians to reposition the Arts and Culture sector as a key player in the nation’s economy with the capacity to generate wealth and employment as well as contribute significantly to the nation’s Gross Domestic Product (GDP). Accordingly, the new vision of the Council under my leadership is encapsulated in the statement culture: the new revenue base for Nigeria. This vision statement is far from being a mere slogan. It is borne out of our firm conviction that there are abounding opportunities in the Arts and Culture Sector that could be harnessed and channeled towards reinventing our economy. It is our determination at the Council to unbundle the huge potentials in this sector to strategically drive the process of economic diversification in line with the policy direction of this administration. Therefore, the theme of this year’s edition of African Arts and Crafts Expo, Our Culture: The Untapped Treasure has been carefully selected to draw attention to the vast opportunities in the sector, and mobilize Nigerians to take advantage of these opportunities for personal empowerment and the economic development of Nigeria. Distinguished gentlemen of the Press, this is the arena at which the 10th edition of AFAC will hold from August 27th to September 17. We are leaving no stone unturned in making this year’s exposition a unique one, featuring unprecedented and memorable events, and much richer both in packaging and in delivery. We have embarked on very wide and extensive consultations with stakeholders and key players in the industry, with a view to aggregating, harmonizing and mainstreaming all shades of opinions in our efforts to rebrand the Expo. We are also carrying out aggressive communication and marketing campaigns to raise national and international awareness on the expo, to give it greater visibility and patronage. I am happy to inform you that the responses so far have been quite overwhelming. This has greatly encouraged us and further fueled our determination to expand the scope of the event and make the edition truly the best amongst its peers in Africa, in line with our leadership role in the continent. As you can see, massive construction and renovation works are ongoing at the site. This is to give practical expression to our determination to elevate the exposition to an international standard that Nigeria and the whole of Africa would be proud of. Before this time, the expo had been held here on a bare, dusty and uneven ground. We have now graded and tarred the main bowl of the exhibition arena, measuring about 1.5 hectares. We plan to also do landscaping and beautification. This year, we are moving away from the tradition of “cut and nail plank pavilion” to specialized and collapsible ones as is done in the civilized world. We have dislodged miscreants from the village and have taken full ownership and control of it. We now have a police post within the premises of the village for 24-hour security cover. For the first time, we have illuminated the entire village with flood lights. We are also constructing and renovating environment-friendly public utilities to make the arena a conducive social environment for our exhibitors, delegates and clients. Distinguished gentlemen of the press, ladies and gentlemen, we are introducing new components into the exposition to add value to the event and impact on the life of all stakeholders. For the first time in the history of AFAC, we are introducing skill acquisition programme in order to build or enhance the capacity of our creative artists in various areas. Renowned craftsmen and women in Nigeria have been invited to assist in imparting their knowledge and skills to selected delegates from the States in various aspects of Arts and Crafts. In the same vein, the National Association of Nigerian Chefs has been invited to mount a stand to teach Nigerians and non-Nigerians alike, the rudiments of Nigerian cuisines such as amala, tuwo, banga and edikangikon soup, among others. Similarly, experts would also be available to teach interested participants the simple way of communicating in our major indigenous languages like Hausa, Igbo, Yoruba among others. We expect that prospective beneficiaries of this training would be able to greet, exchange pleasantries, buy and sell in Nigerian languages outside their mother tongue. We are also having an Investment Round-Table in the course of the exposition. As the intellectual component of the programmes, the round-table will provide a veritable platform for a robust and engaging discourse on the theme of this year’s event. It will be a forum for cross-fertilization of ideas on how we can effectively explore the untapped treasures in the sector, to empower our people and drive the process of economic development. Gentlemen of the Press, you are all aware that the world has now become a global village. There is no nation in the world that is an lsland unto itself. In line with global trends, we must continue to build diplomatic bridges across international frontiers. Accordingly, we see AFAC as a critical tool for fostering cultural diplomacy and engendering international friendship and goodwill. It is for this reason that we would be hosting Cultural Attaches in Nigeria to a Pre-AFAC Dinner. This is to engage the attaches in an informal setting and strengthen the cultural affinity between Nigeria and other countries of the world. This will no doubt greatly facilitate cultural exchanges and strengthen the bond of friendship between Nigeria and the rest of the world. Finally, gentlemen of the press, let me sincerely thank you all for your support and cooperation. I will continue to count on your kind assistance in the task of rebuilding the Arts and Culture sector in Nigeria. I rely on your full coverage of the event. The expo will open for business on August 27. The Official Opening Ceremony shall take place on 5th September. The gap is to give adequate time for participants from all parts of the world to arrive and to fully settle down for business. We shall continue to update you with all relevant information and events as they unfold. Once again thank you for coming and please enjoy your weekend.